Civil disobedience is a powerful and traditional way for Americans to resist bad government policy. The most famous example is the way civil rights leaders used disobedience (and armed self defense) to help end the Jim Crow laws imposed by state governments. It’s also encouraging that gun owners have no intention of obeying bad gun control laws, with evidence of massive resistance to bad laws in states such as Connecticut, Colorado, and New York. And motorists ended the use of speed (i.e., revenue) cameras in Arizona in part by simply ignoring the fines that arrived in the mail (folks in Houston needed to use a referendum). These are encouraging stories, but we also need to be realistic about the fact that most Americans meekly comply with lots of other bad laws and regulations imposed by greedy and overbearing governments. The regulatory burden in the United States has become absurd, for instance, but it’s difficult to envision a successful strategy to resist various bureaucratic impositions. The great scholar Charles Murray has a column in the Wall Street Journal about fighting back against the regulatory state. He begins with a very depressing assessment. America is no longer the land of the free. We are still free in the sense that Norwegians, Germans and Italians are free. But that’s not what Americans used to mean by freedom. It was our boast that in America, unlike in any other country, you could live your life as you saw fit as long as you accorded the same liberty to everyone else. …with FDR’s New Deal and the rise of the modern regulatory state, our founding principle was subordinated to other priorities and agendas. What made America unique first blurred, then faded, and today is almost gone. In some sense, we’ve been buried by red tape. …consider just the federal government. The number of federal crimes you could commit as of 2007 (the last year they were tallied) was about 4,450, a 50% increase since just 1980. A comparative handful of those crimes are “malum in se”—bad in themselves. The rest are “malum prohibitum”—crimes because the government disapproves. This is something that we’ve already discussed. I made the distinction just the other day between real crimes (which involve an infringement on someone else’s life, liberty, and property) and innocent behavior that is criminalized by government. But it’s even worse when folks have no idea how to be compliant. Everyone knows how to obey the laws against robbery. No individual can know how to “obey” laws such as Sarbanes-Oxley (810 pages), the Affordable Care Act (1,024 pages) or Dodd-Frank (2,300 pages). We submit to them. The laws passed by Congress are just the beginning. In 2013, the Code of Federal Regulations numbered over 175,000 pages. Especially when constitutional protections are weakened. It gets worse. If a regulatory agency comes after you, forget about juries, proof of guilt beyond a reasonable doubt, disinterested judges and other rights that are part of due process in ordinary courts. The “administrative courts” through which the regulatory agencies impose their will are run by the regulatory agencies themselves, much as if the police department could make up its own laws and then employ its own prosecutors, judges and courts of appeals. And the insult to injury is that many regulations make no sense. Regulations that waste our time and money are bad enough. Worse are the regulations that prevent us from doing our jobs as well as we could—regulations that impede architects from designing the most functional and beautiful buildings that would fit their clients’ needs, impede physicians from exercising their best judgment about their patients’ treatment, or impede businesses from identifying the best candidates for job openings. …Public-school teachers typically labor under regulatory regimes that prescribe not only the curriculum but minutely spell out how that curriculum must be taught—an infantilization of teachers that drives many of the best ones from the public schools. You can fight these bureaucrats in their kangaroo courts, or maybe even force the case into a real court. But Murray acknowledges that this is prohibitively expensive. Charles has an idea of how to overcome this problem. …the regulatory state is the Wizard of Oz: fearsome when its booming voice is directed against any single target but, when the curtain is pulled aside, revealed as impotent to enforce its thousands of rules against widespread refusal to comply. And so my modest proposal: Let’s withhold that compliance through systematic civil disobedience. Not for all regulations, but for the pointless, stupid and tyrannical ones. …it should be OK to ignore the EPA when it uses a nonsensical definition of “wetlands” to forbid you from building a home on a two-thirds-acre lot sandwiched between other houses and a paved road…there’s no reason for the government to second-guess employer and employee choices on issues involving working hours and conditions that don’t rise to meaningful definitions of “exploitation” or “unsafe.” …Let’s just ignore them and go on about our lives as if they didn’t exist. That’s sounds nice, but how does one overcome the risk of discriminatory and abusive prosecution and persecution by miffed bureaucrats? Here’s the clever proposal Charles has for the private sector. People presumably will be willing to fight if they have some free talent coming to their defense. I propose…a legal foundation functioning much as the Legal Services Corporation does for the poor, except that its money will come from private donors, not the government. It would be an altruistic endeavor, operating exclusively on behalf of the homeowner or small business being harassed by the regulators. The foundation would pick up all the legal costs of the defense and pay the fines when possible. The measures I propose won’t get the regulations off the books, nor will they improve the content of those regulations, but they will push the regulatory agencies, kicking and screaming, toward a “no harm, no foul” regime. They will be forced to let the American people play. And if you want to see this strategy in the form of a picto-graph, this is a very helpful depiction. I mentioned yesterday that I was in Poland for a Liberty Fund conference. After the conference, I had the opportunity to visit the Solidarity Museum, which commemorated the 1980 protests against communism at the Gdansk shipyards. Here’s an image that warmed my heart. One of the rooms had a tape of Poland’s communist dictator announcing martial law. 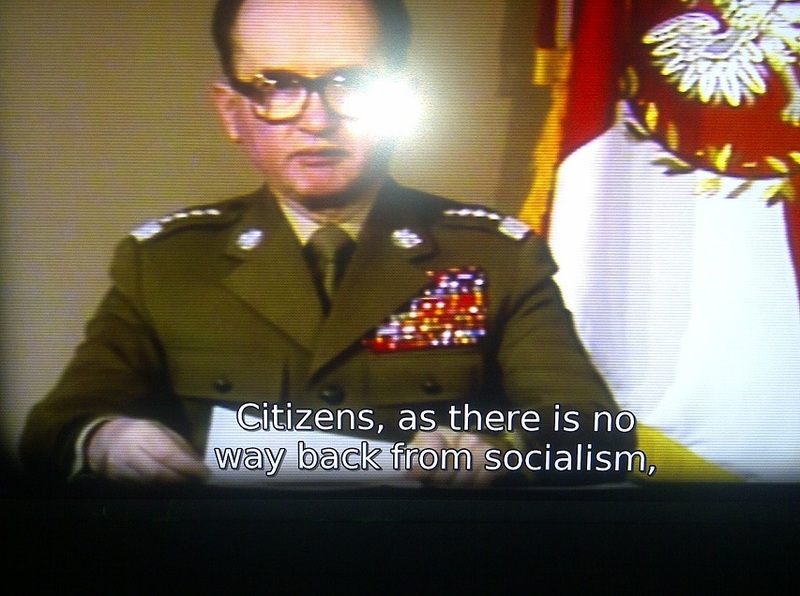 Here’s a screen capture of him saying there’s no turning back from socialism. Gee, that didn’t turn out to be the case. Indeed, Poland is now a reasonably good example of how markets enable higher living standards. And that speech should be a permanent memorial about the evil of communism. And if you want further reminders, click here, here, and here. Liberals and conservatives both want a regulatory state. Just in different forms. I see a possible problem, though. The “Madison Fund” will need a great deal of corporate sponsorship. “Regulatory Burden” has become a barrier to entry (and to competition). It has become the new form of mercantilism. Large, established companies may resist the fight against Regulatory Burden, since that is a primary source of their government-sponsored monopoly. Henry David Thoreau’s “Civil Disobedience”. Charles Murray has proposed a very good response to the metasticizing regulatory bloat that threatens the liberty and prosperity of all Americans. I, for one, will enthusiastically support the Madison Fund as I believe it could potentially be a great benefit to the hard working but increasingly regulated/oppressed middle class, and serve as a counterbalance to the overreaching of the regulatory state. The biggest problem with the Madison Fund is the size of it… hundreds of millions to be spent in litigation. Opportunities for graft and corruption abound – just as they do in most larger corporations (and, of course, in government). How do you control this? How can you guarantee that even a majority of the donated funds go for their intended purpose and not for overhead, as in so many good causes gone tawdry – such as the American Red Cross and the United Fund. I’m thinking of establishing an insurance underwriter. A company funded by its policy holders – those willing to buy some ‘insurance’ against government bullying. But I’m not a lawyer. Is it possible, using the bylaws of the insurance corporation, to place absolute constraints on where the policy premiums will be spent?